TEHRAN, Iran (CNN) -- Iran's government Tuesday banned international media from covering rallies in Tehran being held in the wake of last week's disputed presidential election. Supporters of Iranian opposition leader Mir Hossein Moussavi protest Monday in Tehran. The decision comes after video footage emerged showing violence at demonstrations in support of opposition leader Mir Hossein Moussavi. Moussavi has contested the results of Friday's election, which showed an overwhelming victory for hard-line President Mahmoud Ahmadinejad. 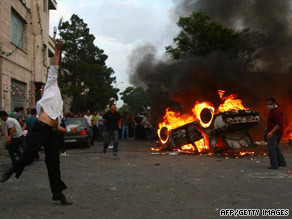 Moussavi's supporters have taken to the streets, often clashing with police and Ahmadinejad's backers. Iran's government had criticized some of the media coverage and images, describing them as biased. International news outlets, including CNN, can talk about rallies in their live reports, but they are not allowed to leave their hotel rooms and offices. Moussavi asked his backers to forego a planned rally Tuesday in the same area as the pro-Ahmadinejad gathering at Vali Asr Square in Tehran. Instead, his supporters gathered at a different location in the capital, according to video footage of the rally. In addition to restricting international journalists, Iran also blocked access to certain online communication tools -- text and video -- but many Iranians were able to find a way around the restrictions. Seven people were killed Monday night in Tehran, government-funded Press TV said. Iran's election authority has agreed to recount some votes in the disputed election, but Moussavi has rejected the idea, asking instead for fresh elections. CNN's Reza Sayah and Samson Desta in Tehran contributed to this report.